2900 PSI PRESSURE WASHER is rated 4.8 out of 5 by 475. Rated 5 out of 5 by Joeys from Unexpected I bought this for our company 2 months ago and have been using it heavily almost every day since. It was originally for cleaning material and trucks but i decided to re-finish our wood retaining wall last week with it too. This is a small machine, basic design but don't let it fool you because when i wasn't careful it was blasting chunks out of the 6x6's on the wall. I really wasn't expecting all that from this machine. She has some power for sure for being so tiny. The only thing is, and was expected, was that it has a small fuel tank so we will have to fill her 2-3 times in one decent use. Other than that fantastic. Rated 3 out of 5 by byrds8 from I purchased this to replace an older electric one I had. I love the pressure in it once it finally gets going. Its much better with that over the old electric. However, it does take a bit for it to become steady. It seems when it starts out it wants to have pressure then looses it for a moment and goes in spurts. I will also say, it eats gas like there is no tomorrow. I assumed it would run pretty much like a lawn mower as far as how fast it would empty a tank. This just wasnt the case. My tank was empty before the car was done being washed. I got a little over half way. I also like the way I can adjust the sprayer from the wand itself without having to change out wands. Rated 5 out of 5 by Austinodum88 from Outstanding devise I purchased the ryobi pressure washer because I have a couple of ryobi tools already and they have been great help around the house. Great strength and battery life. The ryobi pressure washer I wasn’t sure about how the quality would pan out since it was a gas motor instead of a battery but I was quickly amazed. Out of the box easy to assemble looks awesome. I’ve used the pressure washer 7 times and pulled the crank rope 7 times. That is unreal. The motor is so quiet and also so powerful. And finally the multiple spray stream adjustable head on the gun is awesome makes getting the job done so much easier. Rated 5 out of 5 by Bjar from Best bang for the buck I bought this power washer because I needed to complete several jobs that the smaller unit that I had would have taken way to long to complete. I read a few reviews about several different units and decided to choose this one. Bottom line this washer blows, as i was impressed with its over all performance in several ways. From the size and ease of use to power ratio as well as the weight and run time on a tank of gas. It easily removed 50 or more years of build up on my front walk(see photo). I recommend this washer to everyone as it is by far the best on the market for the price point. Rated 5 out of 5 by BillyBee53 from Convenience and Great Features I bought this pressure washer a month ago and I am so glad that I did. I was surprised how quickly I was able to assemble it right out of the box, just connect the hoses add oil and I was ready to go. The engine started on the first pull and the multiple select pressure nozzle made selecting the right tool for the job quick and easy. I was able to pressure wash my sidewalks, porches, driveway, fence and walls on my home so quickly. Everything looks new again! Storage of the hoses was a breeze and the wheels make moving it around a snap. I would highly recommend this pressure washer to everyone. The 2900 psi is more than enough to make cutting through that built on dirt and grime quick and easy! Rated 4 out of 5 by jclee from Easy to use and maintain I bought this one month ago to replace an electric pressure washer. 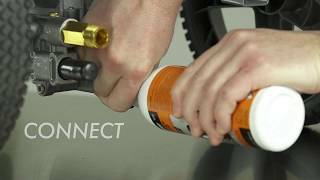 This product is very easy to use and powerful enough for all my tasks, including pressure washing wall, chimney (with another extension wand bought separately), deck, drive way and cars. It is also easy to maintain. I am very happy with it so far. Though the engine seems to be of quality built, some of the plastic parts don't feel high quality. For example, the knobs seem to be made with low quality plastics. I am not certain how durable it is since I only have it for a month. I hope it will last for a long time. Rated 1 out of 5 by Zachary from Do not buy I purchased this piece of junk a few months ago from home depot. I have many other ryobi tools and have really loved them all. I thought this tool would carry the same quality as the others. I was wrong. I hot to use this pressure washer for the second time and it won't maintain pressure. I literally used this less than 12 hours ago and it never moved from the same spot. I called the "tech support" and they asked me to tap on the regulator gently as the first solution. The second was send it to a repair shop. So much for "technical" support. I don't have time to wait for a repair since i am moving 2800 miles in 2 weeks and its freaking christmas time. Please don't be like me and trust this brand or their product. 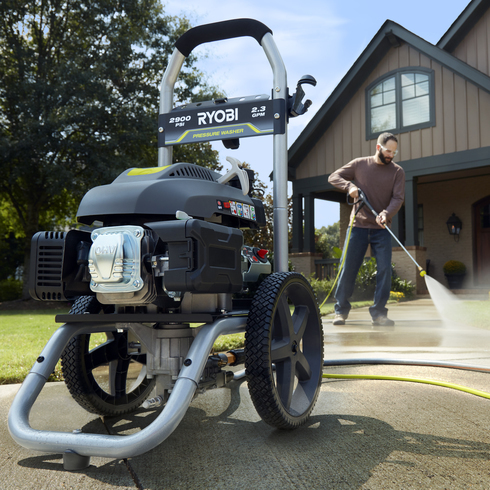 The RYOBI 2900-PSI Pressure Washer is engineered to handle even your toughest jobs. With a powerful OHV 173cc gasoline engine, this RYOBI Pressure Washer delivers 2900 PSI of force for quick cleaning of driveways, decks, windows and other areas around the house. Featuring a durable, compact frame design and large 12 in. flat-free wheels this pressure washer is designed for easy transport. The 35 ft. non-marring high pressure hose provides 40% longer reach for access to even the toughest areas. 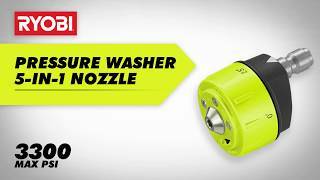 For added convenience, the RYOBI 2900 psi Pressure Washer is equipped with a 5-in-1 quick-change-over nozzle for versatile cleaning. 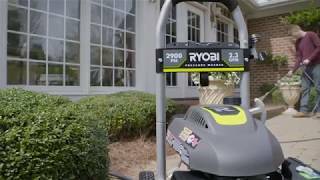 The RYOBI 2900-PSI Gas Pressure Washer is backed by the RYOBI 3-Year Limited Warranty and is guaranteed to deliver results for years to come.